The fields of Europe could soon take on a shimmering silver colour as farmers grow giant grasses to try to mitigate the effects of global warming. The latest studies suggest one form of elephant grass would make a productive "energy crop" to be burnt in power stations to generate electricity. 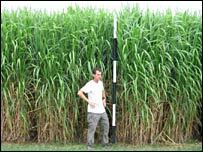 Scientists told a Dublin conference the 4m-high Miscanthus needs little fertiliser to produce very high yields. A breeding programme would improve its economics still further, they said. "There's no reason why in 10 years' time this shouldn't be widely exploited," commented Professor Mike Jones, an Irish expert on plants and climate. "If we grew Miscanthus on 10% of suitable land in [the 15-member] Europe, then we could generate 9% of the gross electricity production," he told the British Association's Festival of Science. Burning biomass is broadly neutral in terms of its emissions of carbon dioxide, the major gas thought responsible for warming the planet. "As the plant grows it is drawing carbon dioxide out of the air," explained Professor Steve Long, from the University of Illinois, US. "When you burn it, you put that carbon dioxide back, so the net effect on atmospheric CO2 is zero. "Whereas, if you take coal out of the ground and burn it, you are adding a net gain of carbon to the atmosphere." Professor Long has been cultivating a hybrid of two Miscanthus species on plots in his home state. The project has managed to achieve yields of 60 tonnes of dry material per hectare. This is a considerable improvement on the trials that have been conducted in Europe, where a typical yield is some 12 tonnes per hectare. But even this lower production is significant. Researchers here said in energy content this would replace about 36 barrels of crude oil. And with a barrel currently priced around $60, such a yield would have a potential value of about $2,160 per hectare. "Biomass crops have always been viewed as something that can only make a tiny contribution to mitigating rising carbon dioxide," said Professor Long. "The point we want to make is that it could actually make a major contribution and it doesn't require big technological breakthroughs to do that." Farmers are increasingly being drawn to the idea. One of its attractions is that harvesting takes place at times of the year when machinery in not being used on food crops. Added Professor Jones: "This is definitely being taken seriously in the UK, where the Department for Environment, Food and Rural Affairs is now funding a major breeding programme." One farmers' cooperative also plans to cultivate 10,000 hectares for burning over the next three years.